A smart drawer that auto unlocks using BLE from your smart phone! With most lock boxes, you need to use something like a key, RFID, or something else that you gotta keep track of to open the device. We wanted to make something that was effortless to get access to the secured box. 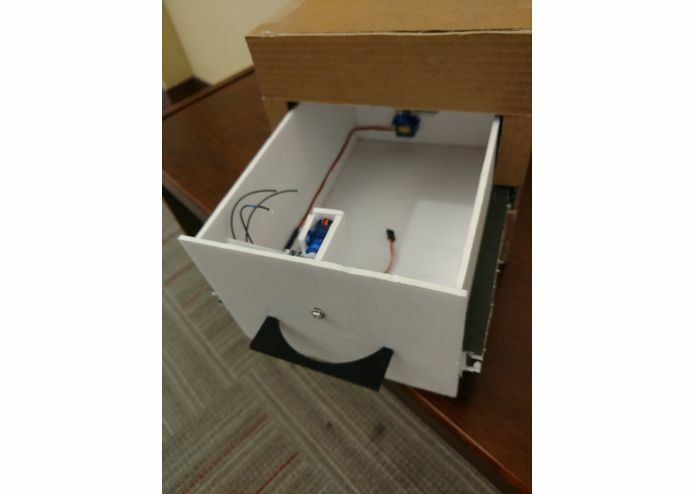 With Bluetooth Low Energy (BLE), we can auto unlock the box which makes for a convenient and secure device! Our security drawer has many features to protect your stuff. We have it locked with a servo. If your phone is near the device (within a foot or two), it will automatically unlock the drawer and you can open it with ease. However, if you are NOT an authorized user, the drawer will be locked. If you try to pick up the box, an alarm to go off and there will be red lights flashing! This will scare anyone trying to take the box. 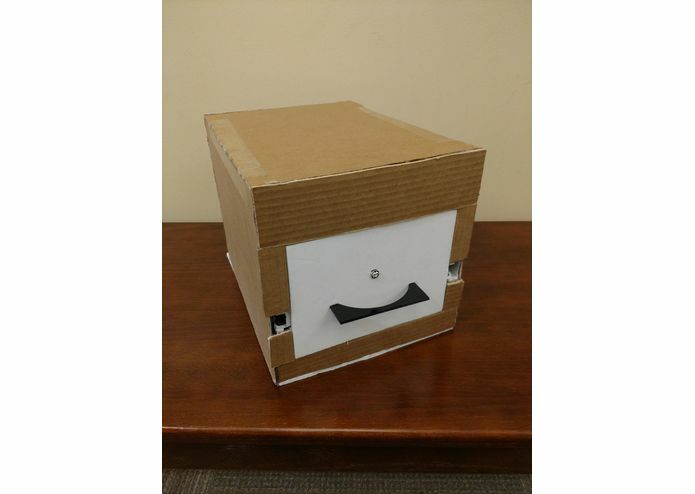 The drawer is made out of foam board and cardboard with an acrylic handle. It has a servo on the inside to handle locking and unlocking. Inside there is a board with several devices. We have an Arduino pro mini that controls the LEDs and servo. We also have a 9 degree of freedom sensor to measure force on the box. In addition a BLE module is connected to be able to broadcast out to devices. A service runs on an Android phone that periodically checks for the drawer. If the drawer is nearby, it will start monitoring RSSI (signal strength). Once close enough, the phone sends the unlock command and the drawer will open. Once out of range, the drawer will lock. We ran out of wire and had to improvise a couple times. The BLE module purchased ended up actually being a cheap knockoff with very little functionality. We had to rethink our method of attack to get the project to work. 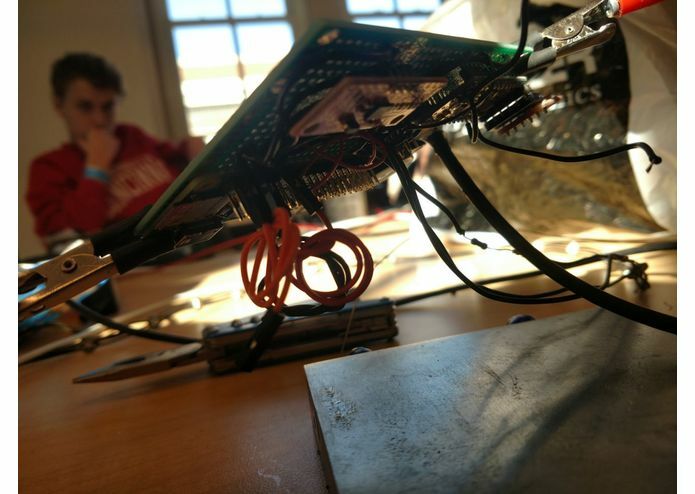 We had to decompile someone elses Android application to figure out how to write our own to interface with the BLE device correctly. You can actually authenticate with your phone locked AND in your pocket. It actually is a 0 effort solution! If you are working with an unknown BLE device, a BLE packet sniffer would be super helpful. Bring enough wire for your project. As always, hardware IS hard. Zener diodes dont work well on data lines. Upgrading to a drawer that you can't cut a hole in. A smaller form factor for the device. Ideally, we would like to be able to adapt it to any drawer. Be wealthy enough to have valuable items to keep safe in our drawer. I setup the BLE service for android to detect when you close to the device and send the open command. 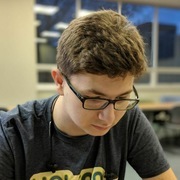 I also did a lot of research on how BLE works and tested many other solutions before arriving on the Android service method.